Fetoscopic Laser Surgery | Johns Hopkins Center for Fetal Therapy in Baltimore, Md. Fetoscopy is a procedure where a small instrument (laparoscope) is inserted into the uterus in order to see the fetus and placenta. Fetoscopic laser surgery offers the best chance of curing twin-to-twin transfusion syndrome (TTTS) or twin anemia polycythemia sequence (TAPS) in a single treatment procedure. The Johns Hopkins Center for Fetal Therapy team is highly experienced in fetoscopic laser surgery. Our procedures are performed in a state-of-the-art, dedicated intervention suite that allows all parents to be present at the procedure. Using the smallest equipment possible, we are able to perform the majority of fetoscopies under local anesthesia but are also able to offer epidural anesthesia if desired. The procedure starts with an ultrasound examination to find the best insertion site for the fetoscope. After a small skin incision at that site, the fetoscope is inserted into the uterus under continuous ultrasound guidance. Once we are in the uterus, a laser fiber is inserted into the fetoscope, and the placental vessels that cause the TTTS are coagulated under direct vision. 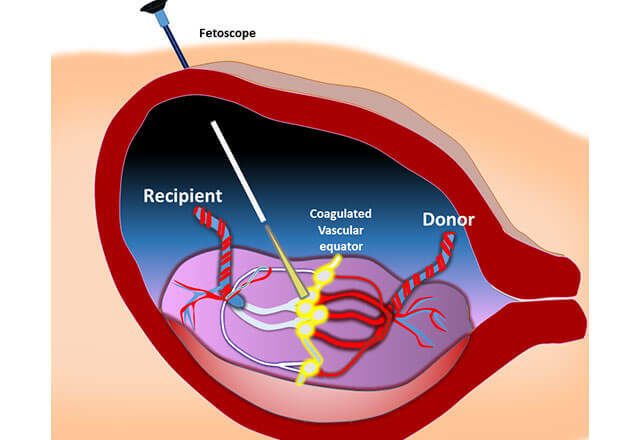 Our research has shown that coagulation of the placental surface between the connecting vessels (called equatorial dichorionization, or Solomon technique) provides the best outcome after laser surgery. At the end of the procedure, the excess fluid is drained through the fetoscope. In this video, Dr. Ahmet Baschat , director of the Center for Fetal Therapy, presents footage from a minimally invasive in utero surgical procedure that can correct twin-to-twin transfusion syndrome and twin anemia polycythemia sequence. Following laser surgery, most of our patients are able to return to their regular activity by three weeks. Weekly follow-up ultrasounds are performed during this time to document resolution of TTTS or TAPS, which are typically complete in two weeks. Because the surgery is minimally invasive, it does not affect the type of delivery required or future childbearing. In some instances, TTTS or TAPS may be complicated by preterm labor, shortening of the maternal cervix, preterm premature rupture of the membranes, fetal growth restriction or fetal cardiac issues that do not completely resolve with the laser surgery. Under these circumstances, we are able to provide our patients and referring providers with an individualized care plan to manage these issues. After birth, children with TTTS or TAPS are at increased risk for neurodevelopmental delay. One distinguishing feature of our program is the availability of specialized developmental follow-up for children after birth through the Kennedy Krieger Institute.